Lesson 28 starts out by visually comparing Mind-Intellect-Ego of a samsari (life controlled by desires) – and of a Self-Realized person (jivan-mukta). Then we correct common false notion of limiting Ishvara (God) to space-time. And see how even anger is Ishvara, thus pushing anger away is pushing God away. Finally, we discuss what it means to say “I am NOT the doer”. The real doer is Īśvara. This understanding is key to your freedom (moksha). sūkṣma-śarīra OR antaḥkaraṇa: SUBTLE BODY. Faculty in which all experiences are known, including Self-Knowledge. Subtle Body consists of: Mind (manas), Intellect (buddhi), Ego or “I-sense” (Ahaṃkāra). Saṁsāra means: A mind that is entangled in worldly objects. Why is it entangled (deeply involved with or invested into)? Because such a mind gives VALUE to worldly objects, which are by nature VALUE-NEUTRAL. Thus a saṁsārī (meaning: jīva caught in saṁsāra in order to please itself) lives a life of ACTION, constantly DOING in order to: (a) Get rid of things it doesn’t like (b) Get things it likes (c) Maintain the things it likes. Because with an incomplete/partial understanding of God, a saṁsārī treats or sees God as something apart from him-her, and God is located in SPECIAL places of worship (temples, churches, meditation room, etc). Such a person imagine God more holy/significant then their own parents or a cockroach or a pelican or a microbe. Thus a saṁsārī’s mind is STILL dominated by their raga/dveṣa (attractions/repulsions, likes/dislikes). Meaning, saṁsārī’s life is guided by their BINDING vāsanās. Vāsanās (tendencies) which “bind”, are those which invoke strong desires (Rajas) or cravings or yearnings to perform or experience something. Why? Because there is simultaneous fear (Tamas) of NOT getting what I want, because of ___ (various psychological reasons). Therefore, Raja and Tama guṇa are always together. And how do these two guṇas operating, cause entanglement in saṁsāra? One begins to feel uncomfortable when binding-vāsanās are triggered (eg: cake, smoke, socialize, gossip, wear certain clothes, put on certain perfume), but are not satisfied. Fact is, noone likes to feel uncomfortable. Therefore person begins to entertain thoughts how to satisfy his-her binding vāsanā. Eventually thought is manifested or performed in the world, which is a Karma (meaning action in form of doing). Every Karma becomes a CAUSE, which produces a seen/unseen Result (EFFECT). This constant DOING (cause) produces constant EFFECTS in life. And every effect needs to be addressed by another DOING (cause). Thus, reason saṁsārī mind-intellect is extroverted is because one is busy attending to his-her binding-vāsanās (strong cravings you find nearly impossible to NOT perform because it’s so normal to perform them). Which cause one to DO action in the world… in order to address the consequences (effects) of past actions. So while life seems like random actions, it’s not random at all. Your life is a perfect symphony of Causes-Effects operating every seconds. 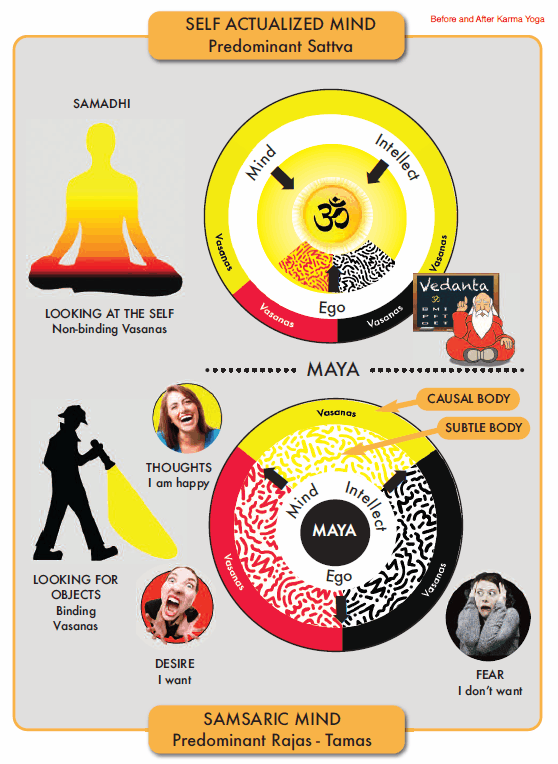 Finally, notice the smiley woman is yellow (Sattva)? This is because anytime you are happy or feeling high, it’s because Raja/Tama guṇa are minimal quantity in the Intellect (predominantly Sāttvic) in that short time. Analogy: it’s like cleaning a dusty mirror, and letting the full sunshine (pure Consciousness) reflect on the mirror (Intellect). This reflection is called: Ātman. Meaning Ātman (pure Consciousness seemingly conditioned by 3 guṇas – and operating in jīva’s 3 bodies)… IS Brahman (pure Consciousness). So it’s in the Intellect (buddhi) where Ātman is known. Or where your sense of Existence is known. Therefore, when Intellect (buddhi) is NOT covered by Rajas/Tamas, then you are happy. Why? Because you are experiencing your original Nature (Ātman; full/whole/complete). Notice, I didn’t say “happy”. Because “happy” is another attribute. Even though we use the word “happy” to communicate our fullness/wholeness/completeness. How do we prove above statement? When you are completely happy, do you want anything in that moment? No. Why? Because you’re experiencing fullness/wholeness, which does NOT demand anything. Because what is COMPLETE is already COMPLETE, and nothing can add onto it’s COMPLETION. You’ll notice proportion of Sāttvic vāsnās are greater then Rajas/Tamas. This is ideal and what a serious aspirant would be aiming for. The fact that Rajas/Tamas are small implies a LOT of work was done (in form of Karma Yoga) in order to reduce the constant pull of one’s desires (Rajas) and fears (Tamas) controlling one’s life. Next question is, what does large proportion of sāttvic vasanas imply? That one is CONSTANTLY exposing their thoughts/senses to Śāstra (scriptures), in form of reading, watching video’s, listening, bhakti, etc. Meaning such a person discovers far greater joy within, then in the external world. Why? Because Self is unchanging. It’s nature is whole/full/complete. Thus one seeks refuge in Self. Instead of seeking refuge in ephemeral joys of the changing world which guarantee no lasting fulfillment. World we see and experience is called jagat. Jagat means “scheme of things”. And you are NOT separate from jagat. Because jagat is a manifestation of Īśvara (macrocosmic Causal Body; meaning THAT which causes all things to BE – by it’s All Knowledge, All Power). Let’s take psychological order, which is responsible for your emotions. And one of the emotions is Anger. So let’s give this an order for comprehension: Anger > Psychological order > Jagat > 5 elements > Īśvara > Truth of Īśvara is sat-chit (Existence/Awareness, Brahman, pure Consciousness). What this means is: Anger itself is Īśvara (All Knowledge, All Power). I am NOT saying “Īśvara (God) is angry”. This is stemming from incomplete religion. You can not attribute any attribute to Īśvara, because Īśvara is All Knowledge, All Power as possibility. This possibility is constantly manifest into form. And we experience it’s effects as this ENTIRE PHYSICAL UNIVERSE (virāt), which scientists are so fascinated by! Anger is just another possibility manifested. Which means, Īśvara is not “out there” somewhere. If you understand that the entire Universe, including you, are manifestation of Īśvara, than Īśvara is in your anger, no more or less then in the holiest thought. So why look for God somewhere “there”? When every emotion itself is also manifestation of Ishvara. Result of this understanding “There is ONLY God”, one can drop the concern of being “disconnected” or “not feeling” God. You (Jīva) are ALWAYS an effect of God (Īśvara). Therefore God can’t be experienced in some time in future (implying God is not HERE) as some distinct experience. All is God. And God is All. Even these words you (Jīva) are reading NOW is God. Finally, both the Jīva and Īśvara enjoy the one same Reality being Existence/Awareness (sat-chit), which YOU are (tat tvam asi). Summary: Last place we look for God is in our anger – because of our ignorance of what God is. Even some religions treat anger as anything but God. Why not? Explain what it means to say “I am not the doer”? If “you” means Body-Mind-Intellect, then yes, you ARE the doer. If “you” means Existence/Awareness (sat-chit), only then can we say “I (Self) am not the doer”. But we can only say both, after we have TOTAL CLARITY of Satya-Mithyā and their relationship. In other words, must know relationship between: (a) Jīva (b) Jagat; manifest world caused by Īśvara (c) sat-chit (Existence/Awareness). Otherwise, saying “I am not the doer”, is superficial knowledge which carries no depth to it. Worse yet, in stage of ignorance, the word “I” is associated to ego (doer/enjoyed). Thus for saṁsārī, this statement reads “I (ego) am not the doer”. In which case, such person justifies actions of adharma (what is NOT right), using excuse “Īśvara is the real doer”. Thus such foolish and dangerous jīva is falls in trap called “jīva-sṛṣti” (state of majority of world today). This is when one projects their own false ideas (because of uneducated Intellect about TOTAL Reality) onto the world. And they don’t know they’re projecting. So to them, the false projection is the TRUTH of Reality. That’s why you can’t talk such individuals out of their delusion. It’s too real and solid. This happens in religions also. Ever heard of priests molesting children? Slaying those who don’t believe in your God? Woman are evil? Yoga ‘guru’ sleeping with genetic-perfection female attendees. List is endless! These irrational/illogical/himsa projections have somehow survived for centuries. Why? Because the religion/philosophy itself is incomplete. IF it was complete, you wouldn’t have these mistakes being made. Best solution for encountering a jīva-sṛṣti: Politely walk away or change the subject to something more down to earth. Or any other non-injurious (ahimsa) solution of your own. Realize, Īśvara eventually straightens everyone out in course of time.